Behind nondescript facades, some of Dublin’s oldest houses are being lovingly preserved. ON DUBLIN’S THOMAS Street it’s easy to get distracted. Your eyes might be drawn to the discounted prices on giant boxes of washing powder or the glisten of the sun on a fake gold watch, as the street traders chat to each other and to passing locals. Perhaps, if you are familiar with the street, you will recall never having noticed a barber’s shop called Fades and Blades on the corner of Bridgefoot Street, almost opposite Arthur’s pub. Fades and Blades has a brown wood façade and one of those red and white candy-stripe signs, that tells you it’s a barber’s shop. From the outside, the building blends in with its neighbours and appears to be very ordinary. But venture inside and you will get an opportunity to glance back in time – all the way back to 1639 when the house was built. Some features have been retained since that time. Number 130 Thomas Street is the oldest house in Dublin – not surprising in a way, since Thomas Street is one of the oldest roads in the entire city. Known as Slighe Mor, Thomas Street was originally one of the great roads crossing Ireland. Around the time number 130 was built, it was emerging as a bustling centre of the silk trade. Inside Fades and Blades, the building has been lovingly restored. The original wooden beams can be seen on the ceiling of the barber’s shop, as can some of the original brick work. Behind modern wooden walls, the entire original, interior walls have been preserved. A glass panel behind the cash desk provides a glimpse at the original walls, complete with peeling wallpaper. Upstairs the spacious apartments have also retained features of the original house. We don’t know who built 130 Thomas Street. But we can assume they were wealthy, says Graham Hickey, conservation director, with the Dublin Civic Trust – and it may well have formed part of a larger house. There are lots of pre-Georgian buildings scattered on most of the main central streets of Dublin. Hidden in plain sight. You don’t notice them from the outside, because they have usually been re-faced or altered, their facades go up and down like wallpaper. 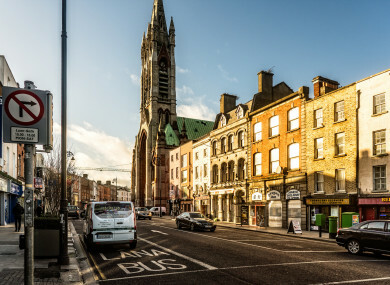 Capel Street, Thomas Street and Aungier Street are among the oldest streets in Dublin so if you pass through any of those streets you are certainly passing places that are absolutely steeped in history, he says. The timber-framed internal structure will be maintained while a restaurant downstairs and offices above are developed. It’s a technical task to save those features for the future generations. Using a steel frame, builders “stitch in” new supporting walls around the existing building, he says. The builders say that it is a lot of hard work to preserve what is left of those old walls but it’ll be worth it in the end they reckon. So what are some of the other unexpectedly old buildings around the capital? Before 130 Thomas Street was crowned as Dublin’s oldest house, another dwelling laid stake to that claim and that was 9 & 9a Aungier Street which was built in 1664. Nestled between Greene’s jeweller’s shop and a burrito bar, it is home to an estate agent and appears totally ordinary from the outside. Inside the building is conserved and retains many of the original 17th century features. It has not yet been renovated, says Hickey. Number 9 Aungier Street employed the timber framing typical of medieval Ireland, along with Georgian masonry and so it provides something of a link between the two eras. The Aungier Estate, as it was called at the time, was an elite development for wealthy people – so the owners of number 9 and 9a would definitely have been members of Dublin’s high society. Later on, the house was owned by merchant families during the 18th and 19th centuries. It was only in the 20th century that wealthy people started to move out of the city centre for the suburbs, and it was then that 9 Aungier Street was converted to tenements. The @readscutlers shopfront last Friday evening. Granted, if you are planning some retail therapy next weekend a spot of sword shopping probably doesn’t rank high on your list – but back in the 18th century, Irish made swords were in high demand. The building has survived intact since 1760, has been painstakingly renovated to its original fixtures and fittings, and is now up for sale. The owners are looking for offers around €2.5m. The Reads were cousins of the Guinness family and they formed a tight-knit community in Dublin, far from their native Kildare. Elizabeth Read was Arthur Guinness’s mother and his brother Samuel Guinness also traded as a goldsmith just around the corner. It is believed that the collective of cousins supported each other in their business endeavours. Last but not least there is the truly unbelievable tale of one family home. The Casey family has lived at 26 Fishamble Street for hundreds of years, and have stockpiled their family’s stories and belongings down through the centuries since the 1600s. Their story was uncovered recently by the Dublin Inquirer. The current owner of the house, Michael Casey, can trace his family right back to an Elizabeth Pallas who lived there in the 1600s. It is one thing to know your family tree, but quite another to hang on to many of their belongings too. That means 350 years worth of photos, books, sculptures, cabinets, mirrors, paintings and all sorts of other knickknacks. The result is a kind of living museum – with family members belongings reflecting what life and society were like at each point in time. You might not want to live in that house, it’s a bit cluttered, but it certainly would be fascinating to possess so many clues as to what life was like for generations of your family. Email “Hiding in plain sight: 5 fascinating old buildings around Dublin you probably never noticed”. Feedback on “Hiding in plain sight: 5 fascinating old buildings around Dublin you probably never noticed”.